Fat Angie: Rebel Girl Revolution is a story dedicated to one girl’s journey dealing with bullying, navigating friendship, and her family. It is an intense story. While it’s a sequel to the first book, Fat Angie, you can definitely read the second without the first. Sophomore year has just begun, and Angie is miserable. Her girlfriend, KC, has moved away; her good friend, Jake, is keeping his distance; and the resident bully has ramped up an increasingly vicious and targeted campaign to humiliate her. An over-the-top statue dedication planned for her sister, who died in Iraq, is almost too much to bear, and it doesn’t help that her mother has placed a symbolic empty urn on their mantel. At the ceremony, a soldier hands Angie a final letter from her sister, including a list of places she wanted the two of them to visit when she got home from the war. With her mother threatening to send Angie to a “treatment center” and the situation at school becoming violent, Angie enlists the help of her estranged childhood friend, Jamboree. Along with a few other outsiders, they pack into an RV and head across the state on the road trip Angie’s sister did not live to take. It might be just what Angie needs to find a way to let her sister go, and find herself in the process. Fat Angie: Rebel Girl Revolution is a challenging read. Angie is encountering trouble from all angles: emotionally and physically bullied at school, dealing with her mother who wants to send her to a ‘treatment center’ because of Angie being both fat and gay, reeling from the death of her sister, and having trouble getting through to her friends. My heart ached for Angie and the first half of this book is really difficult to get though, but as soon as Angie embarks on the road trip, I began to see Angie bloom as a character. The first half of the book just consisted of my empathy for Angie’s situation – trapped in a family who doesn’t understand her (her mother is just something else entirely), without any friends, and struggling with her grief. Part of what make my heart ache for Angie is how much her mother does not understand her, how emotionally abusive and just downright toxic she is. And so I’m rooting for Angie to prevail, even though basically everything is against her. 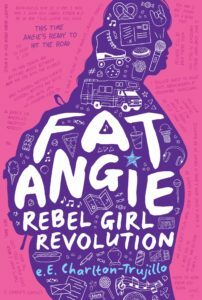 Part of what really moved me about Fat Angie: Rebel Girl Revolution, besides the strong themes of friendship against odds and expectations or the f/f romance, was Angie’s complex relationship with her grief. Grief can take many forms and while there are five stages to grieving, Angie feels a lot of anger. While her sister died a hero, Angie has no where to put this anger, no one to talk to, and the entire treatment of her sister’s death sits wrong with her. By seeing her sister only as a hero, they miss out on all her imperfections, so when she goes on a roadtrip, Angie must come to terms with her image of her sister, and her own regrets. Find Fat Angie: Rebel Girl Revolution on Goodreads, Amazon, Indiebound & The Book Depository. What are your favorite YA books featuring fat protagonists? I really adore Dumplin and Puddin but I can’t think of many others off the top of my head. The mother is going to make me so angry when I read this, and I will read this important book. The obstacles this author has given her character are ones I want to read for myself how things unfold. UGH YES, I could not stand her. like…ugh. Hmm, this one sounds a toughie. So many challenges for Angie to deal with it’s almost overwhelming.